Prove yourself against the pro’s and bring home a Philips UHD Ambilight TV! Visit HERE and find out how to sign up! Only the best of the best get to take on 343. So starting October 30th, ESL will host a two week ladder tournament, with the top 5 teams qualify for the main event. A Halo 5 marathon against the world's most experienced players broadcasted live on ESL. So gather your team and start training those thumbs because every win counts. The 8601 Series Philips Ambilight UHD TV is made for gaming marathons. The immersive effect of #Ambilight makes your game more dynamic and also keeps your eyes from getting tired. 4K UHD resolution and 1800 hz perfect motion rate make sure you don’t miss a thing. Welcome, and excuse our mess! We're excited to support halo 5, and so glad to be back. We want to extend a huge thank you to 343 Industries for all their support. A public API is awesome, and there are so many things to do. We have much work to do, and we can't wait to show you. We are in a beta status right now. You will see bugs. You will have issues, and we're going to be rapidly fixing them. See a bug? Report it! Looking for others to play Halo 5 with? Use our Looking for Group chat! 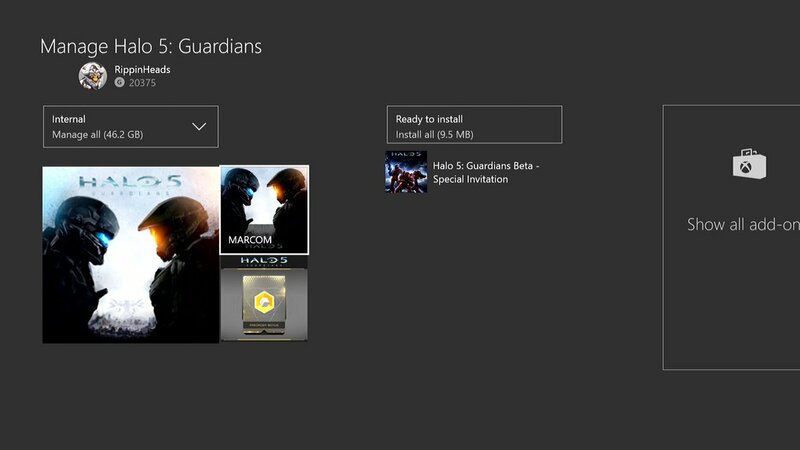 For those of you who've taken the option to download your copy of Halo 5: Guardians early, you might want to check that it's definitely going to work. In an announcement today, Microsoft revealed that a technical snafu means that those who pre-loaded before 21st September might have installed a placeholder file instead of the game itself. Luckily, there's an easy way to check, and a fix in place. Just head to My Games & Apps, and choose to Sort by Size. Check the entry for Halo 5 - if it's greater than 40GB, you're OK. If it's smaller than 40GB, you've got a dud file, I'm afraid. In that case, hit the Menu button, delete that entry, then go the Xbox Store entry for the game - it'll have a big button that says Install. That'll net you the proper version of the game. Time saved (sort of). Here is what your preload should look like! If you partook in the Halo 5 beta last December, it's highly likely that you found yourself placed into a division. Some of you were lucky enough to place into a special tier called 'Semi-pro' and 'Pro' for you exceptional gaming abilities. Yesterday, 343 Industries blew the lid off of refined division system that you will see in the retail version of Halo 5 Guardians. Today, Halo Waypoint announced there will be a Halo 5 API. We are absolutely out of our minds excited. We will definitely be back for Halo 5 stats & leaderboards. But we have some big news. Currently all of Halo 4 and Halo: Reach stats are being hosted on Legacy Halotracker. This will continue to be the case, however legacy will no longer be officially supported. We are looking 100% to the future. We'll keep the site up the best we can, but we will not be filling requests, bugs, etc. We will be starting Halotracker.com from fresh. Wiping all users, all posts, everything and starting fresh to support Halo 5 and beyond. Halotracker will join The Tracker Network and will use a shared login across all of our sites. We are doing this because all of our legacy user systems are outdated, hard to support, and full of inactive users. In the coming weeks, we will launch this, and we're excited to provide a new level of quality to Halo fans. Our old stat pages were ok, but were not always the best designed, or the fastest to pull up. We plan to fix all that and we're excited to show you.